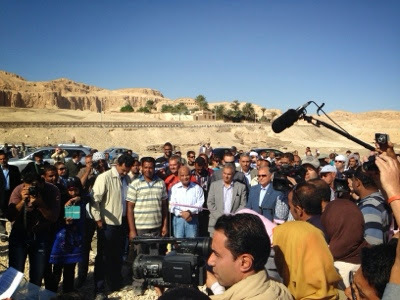 The Amenhotep III temple conservation project unveiled today the two colossi statues of Amenhotep III at the king's funerary temple on the West Bank of Thebes. 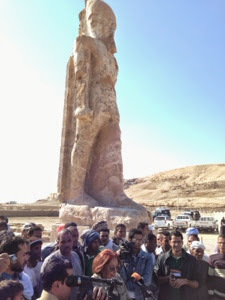 Dr. Hourig Sourouzian gave a small speech at the event and she said "The two colossi are originally monolithic sculpture hewn in the red quartzite of Gebel El Ahmar near Ancient Heliopolis, in modern Cairo. After being toppled by an earthquake in 1200 B.C., they laid for centuries broken in several pieces in the fields, where they were threatened by the usual destructive factors irrigation water, salt, vegetation, fire and vandalism. The king wears the white crown of upper Egypt and the pleated Shendyt-kilt. A broad collar rendered in shallow relief adorns his chest. The belt around the waist is decorated with a zigzag pattern; better preserved on the East-Colossus the belt has a rectangular clasp bearing the names of the king, "Nebmaat-Re, Amenhotep Ruler of Thebes, beloved of Amon-Re". A dagger with a falcon headed handle in inserted in the belt. On 20th of January 2014, work started with the eastern colossus which measures 12.35meters height. It's 71 large parts were gradually reassembled and the numerous smaller fragments were fixed on the body. The colossus was raised in March and unveiled on 24th of March. It consists 89 large pieces and numerous small fragments which are now assembled. The colossus measures 12.95meters height."